I'm back to a 2-0-something kind of weight (207.0 to be exact), "dropping" four pounds since Monday. I think a lot of that had to do with TOM so I'm not really celebrating at all since I didn't have to do much to lose this weight, besides wait out a natural biological process. But it's still nice to see that I haven't gained any weight since my last weigh-in, and actually lost a couple pounds since my last legitimate weigh-in. I suspect I'm actually even lower than that since I've been feeling super dehydrated lately, so I've been drinking a lot of water the last couple of days to try to get myself to where I need to be. In fact, just writing that made me reach for my water bottle and take a long swig of it. You should too. As for rugby...oh, rugby. We have a HUGE game this weekend against a spectacularly good team and my original goal for the season was to start in this game. Well, I'm not and I'm supremely happy about that. I mean, I would love to be good enough to start, but I know my fitness is not even close to that needed for an 80 minute intense match. So my amended goal was to be rostered (a substitute) and that's exactly what happened, which is awesome. I do hope I get to play a few minutes, although I don't think I'll be put in unless someone gets hurt, which is a bummer. The good news on that front is I've beat out one of the girls I didn't think I could for a spot on the roster, and my coach has been training me in a new position, which would give me more depth. She also does think I'm rather good and so there's hope for me to make the starting side a few times next season if I keep improving (and in my opinion) get my fitness up and lose some poundage. BUT, I'm kind of worried about the girl that's in my current position because she's super good, super fast, super strong, and everyone loves her. So there's no real hope of regaining my spot back, I think. Not only would I have to spend the summer in the gym (in addition to swim, bike, run training, work, and school, and some summer relaxation) to get stronger and fitter, but I would also have to learn a whole new position so that I don't have to compete against her. 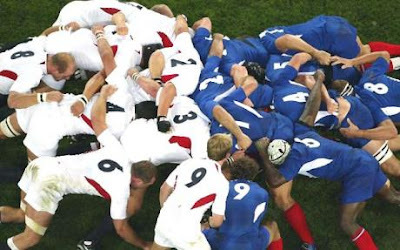 If you're thoroughly confused about positioning, I'm mostly talking about the scrum. I usually play #3 on this team, have played #2 on other teams, and am now training to be #1 (at the top of the picture #1 is above the white #2, actually to the left of him). 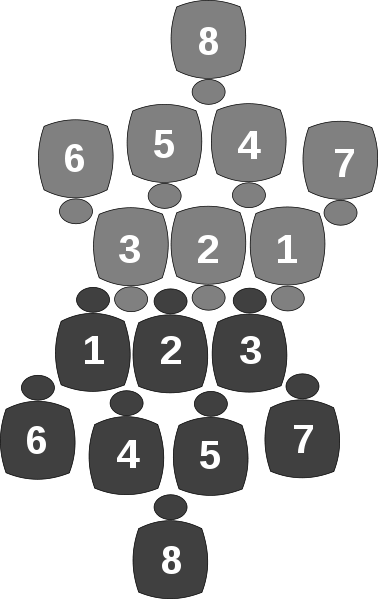 The two positions, #1 and #3, are very similar except #3 goes into a scrum with both shoulders in, while #1 only has his right shoulder in and pushing. And that's what's been throwing me off. That, and binding on with my arm in the right spot. Images courtesy of The Telegraph and Wikipedia, respectively. "Everyone is an athlete. But some of us are training, and some of us are not." "Fitness has to be fun. If it isn't, there will be no fitness. Play is the process. Fitness is merely the product." Getting back on the wagon after an amazing summer of indulgence. Exhausting weekend, now get back on the wagon!